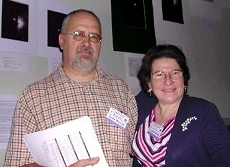 Berto Monard, an AAVSO member and observer, is the first amateur to discover the afterglow to a GRB before the professional community. While many afterglows have been imaged by amateurs, including the famous GRB030329, this is the first time an afterglow was discovered and published by an amateur. The NASA/MIT satellite HETE2 detected a possible GRB on July 25 at 11:46UT. Monard was alerted to the detection of the GRB through the AAVSO GRB alert system and discussion group. He used a .3m telescope at his Bronberg Observatory near Pretoria, South Africa to search the 30 arc minute error pattern that the HETE satellite distributed. Upon comparison with many finder charts he discovered a new object near the edge of the error pattern. Further observations showed the object fading rapidly, as one would expect from GRB afterglows. His discovery was announced in GCN #2324. A few days later he observed the field again and published further photometry in GCN #2334. July 29, the Danish 1.5m telescope at the European Southern Observatory in La Silla, Chile observed the field and confirmed Monard's discovery. Their confirmation was announced in GCN #2335. This GRB and Monard's excellent work is a prime example of why amateurs around the world are needed in this field. It was difficult for professionals to observe this GRB for many reasons, among them: 1. It was very far south (-50 degrees declination) 2. The IAU General Assembly was underway meaning many professionals were out of the office 3. Major colleges in both hemispheres were on holiday break (summer for north, winter for south) 4. An X-Ray flare (XRF) just a few days earlier had used up the target-of-opportunity (TOO) time for many GRB chasers. Amateurs stepped in and filled the void and now a unique GRB afterglow has been observed that otherwise would have been missed. Congratulations Berto! * Read a first-hand account of the discovery by Berto himself! afterglow by Berto Monard in South Africa. continue to provide valuable support for these observations. Thanks very much [for your news] of this exciting development! scientific mystery is truly inspirational.